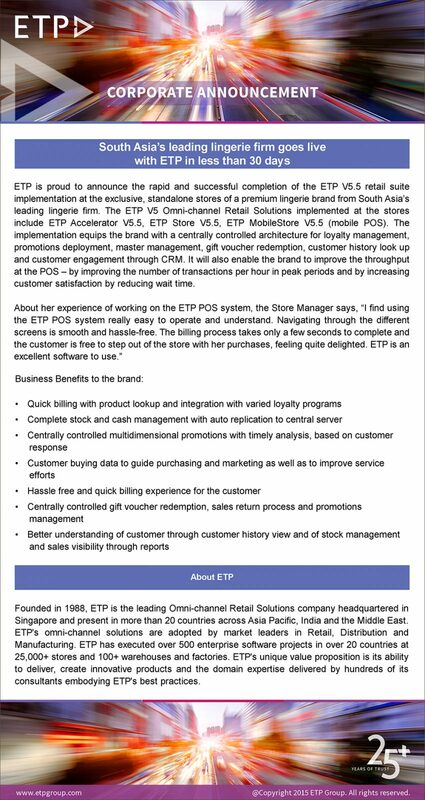 Founded in 1988, ETP is Asia’s leading Omni-channel Retail Solutions company headquartered in Singapore, serving market leaders in more than 22 countries across Asia Pacific, India and the Middle East. ETP’s enterprise class, omni-channel solutions include omni-channel POS, Mobility, CRM, Marketing and Promotion Campaigns, Supply Chain Management, Omni-channel Analytics and Omni-channel Connect. ETP has successfully executed over 500 enterprise software projects across 25,000+ stores for 300+ brands. ETP’s unique value proposition is its ability to create and deliver innovative products and implement them successfully with domain expertise delivered by hundreds of consultants embodying ETP’s best practices. ETP helps its customers get it right in omni-channel retail.